“Oh well, nobody died,” says the Flying Scotsman Graeme Obree as he reveals how depression and his home-built bike wrecked his latest World Hour record bid. 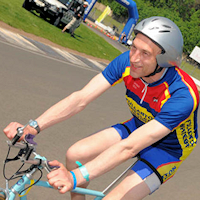 Obree was intent on reclaiming the title he won twice in the 1990s later this month. But the 44-year-old came unstuck when his psychologist warned his mental health was too fragile. The lanky Obree had self built a typically unique bike. With an enormous 67-tooth chain ring for speed, Reynolds 653 tubing and silver soldering, it was ridden with an extreme flat back style and extended arms.